Hello hello, here we are in the second edition of the So-Called Indonesian series. I cooked up an Indonesian staple, called Nasi Goreng, which translates to fried rice. You can find this ubiquitous dish and its many variations in all kinds of eateries in Indonesia, starting from street food stalls to high-end restaurants, in urban metropolitans to whatever secluded tiny island kitchen in the Indonesian archipelago. At its most basic, nasi goreng is almost always served with sliced cucumbers and/or tomatoes, kerupuk (prawn crackers) and sambal. Indonesians eat it any time of the day, including at breakfast and at the 3am post-clubbing Jakarta street food stall. 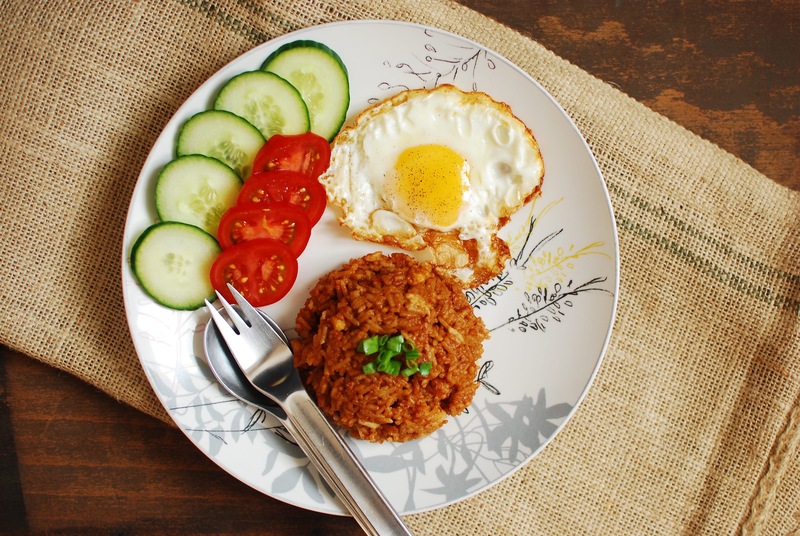 At my parents’, during our London days, we’d often have nasi goreng for Sunday brunch. Our Sunday nasi goreng ritual happened because usually on Saturdays my mother would make some kind of roast chicken, and we’d always have the leftover chicken and rice. This leftover chicken and rice would then be recycled into bubur ayam (a rice porridge with ginger and shredded chicken) by my mother, or into nasi goreng by my sister. Nasi Goreng Kambing: with tender pieces of marinated lamb. Nasi Goreng Pete: with the addition of stinkbean. Nasi Goreng Ikan Asin: with the addition of anchovies/salty dried fish, similar to the Portuguese bacalhau. Today, on an F1 Grand Prix Sunday, as the handsome-and-talented husband is drinking beer and cheering on Max Verstappen, I carried on to make nasi goreng for our Sunday lunch. The handsome-and-talented one is a nasi goreng connoisseur, I have to admit, after being dragged all over Indonesia; it’s his go-to dish and he was looking forward to trying this out. Indonesian Fried Rice (Nasi Goreng) by Saveur, first published on their site on September 6, 2012 and the original recipe is here: http://www.saveur.com/article/Recipes/Classic-Indonesian-Fried-Rice. Make sure you have aluminium foil to toast the terasi (shrimp paste). When heated, terasi emits a really strong smell, more pungent than the Thai fish sauce smell. The Saveur way of toasting the terasi is brilliant, as it keeps the smell to a minimum. The Saveur recipe mentions palm sugar in the intro, but uses dark brown sugar in the actual recipe. Since I always have gula Jawa (palm sugar), I used that. They come in discs, so I used about half a disc and crushed it. Wrap the terasi in the aluminium foil. Heat up a frying pan, no oil, on high. Once hot, place the wrapped terasi on the pan. Leave for 1 minute, then turn off fire. Then flip over using tongs or chopsticks. Let cool, then unwrap. If you unwrap while still hot, it’ll stink up your kitchen; most Indonesians love this, me not so much. In a blender, add the palm sugar, garlic, shallots, chillies, cooled toasted terasi and 2 tablespoons water. Blitz on high till smooth. Set aside. I fry the eggs one by one, and I break my egg into a small bowl first, to avoid splashing hot oil. Heat up the oil in a frying pan. When the oil starts to smoke, pour in 1 unbroken egg. Take off the fire, but keep it on the still-hot stovetop. In 2 minutes, the egg will have cooked through and you can scoop this up with a spatula. Place on a plate, and do the other eggs. 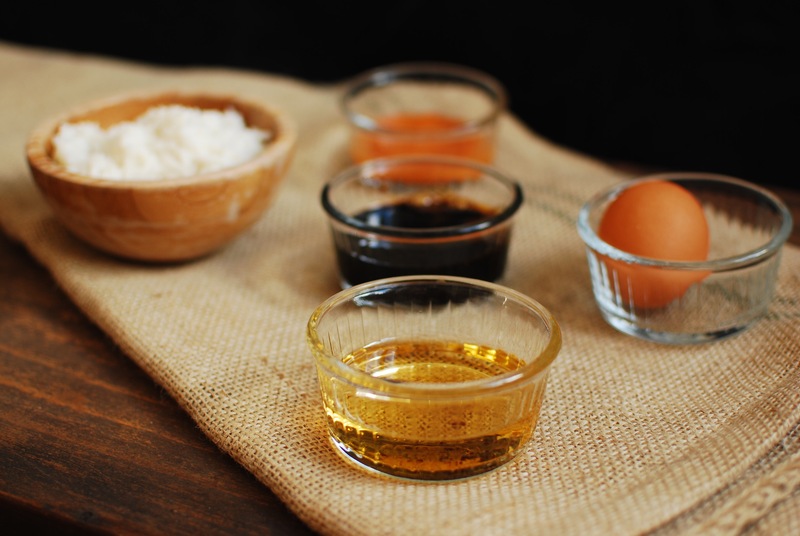 Use the leftover oil from the egg frying. Heat the oil over high fire with the flavouring paste until fragrant, then turn down the fire, and add the rice. Break up any clumps and stir to coat the rice evenly with the paste. Add the kecap manis. Stir fry till mixed. Divide over four plates, serve with cucumber and tomato slices, and the fried egg. Maybe sprinkle slices of spring onions or the ubiquitous Indonesian fried onions on top. Next time, I’ll be sure to have kerupuk udang (prawn crackers) and fried tofu on the side. Mmmm yum, only wish Astrid and Phil were here to taste this. A yummy Sunday lunch! See you in the next one!